Little cub is annoyed by the noisy otters scaring away her fish, but Grandpa reminds her that part of the fun of fishing is just being together, which leads into a long lesson on the nature of God’s love. 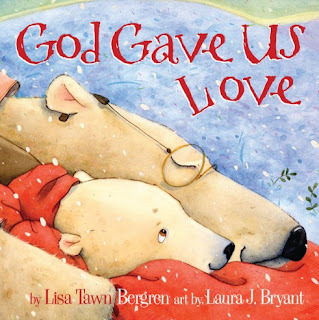 Now I could get all haughty and dissect the theology in the book, but considering it’s a board book meant for children ages 2-5; I think it does all right relaying the beauty of God’s love even when we don’t deserve it. The book delineates between what “like” and “love” are and that mammas and papas love for each other is special and not the way we should be loving others. I imagine that these are all questions that would come up for a child when you’re talking about love to this age group, so it’s good to have a story like this as a catalyst for discussion. There were a couple of drawbacks to the book though. The first one was that there really wasn’t much for storyline or character development. My wife commented that it read like a Sunday School lesson more than a storybook, so don’t expect your child to get attached to or care much about the characters. The second issue is that the lessons are fairly lengthy and don’t have much substance. My two-year old was squirming after about three pages, and then, much like the otters, he disappeared, which you might say is normal for a two-year old, but he’ll sit still and listen forever if we’re reading from his Winnie-the-Pooh book. Why can’t Christian children’s books capture a young audience like that? Sigh, that’s a topic for another day. I wouldn’t go so far as to not recommend “God Gave Us Love” because the morals are solid, but I can’t imagine this becoming the “favorite” bedtime story in your home any time soon.